This is a great collection of tutorials on painting technique, and I hope you'll continue in bringing them to this forum for the sake of everyone who enjoys reading them. I'm no painter. In fact, my skills are limited to line-drawings with a pencil, but I'm seriously impressed by this thread. I wish in my 6 years of art at school the teachers might have thought to at least teach us how to create shadows and light. I found this mighty useful, thank you sir! "I like old things, they make me feel sad." At the risk of sounding churlish, the majority of art school teachers these days (who themselves were trained in the 50',s 60's, 70's, etc) regard this sort of technique as 'ancient history'*, irrelevant in the modern world and quite simply have been happy for the knowledge to be lost. I disagree. *I had to ferret around in some very old books indeed to rediscover these techniques. But that's enough of art politics, hopefully my posts may serve simply to motivate some of you to experiment and find out more about such (in my opinion) beautiful old techniques and apply them to new ideas. And if you are about to go to art school yourself, perhaps you'll even be able to teach your teachers? To Em, Sir Nikolas and The Naysayer - thank you sirs! (& Ma'am). There are art schools in London where they don't even teach life drawing. Students wanting to do it have to club together and work it out off-premesis. My first exposure to the old masters technique was in the 80s thanks to channel 4 and one Tom Keating, perhaps Britains greatest ever forger. He did a book on technique too, It's hard to get hold of, or expensive, but well worth the hunt. Your contributions are just the sort of thing that this forum should be about. I'm very glad that you are here. I'm inspired to try a similar tutorial on prop making. Others with skills to share should do likewise. Here, it's more of a case of the Visual Arts syllabus not focusing on technique, just general understanding of a few selected media. The teacher I currently have actually did teach life drawing classes outside of school that I had been attending. They were very worthwhile. Secondly, I heartily second that exhortation to buy proper cobalt blue, not cobalt blue hue - they are different colours, certainly in watercolour and acrylic (I've not used oils for years, don't have the patience! ), and certainly the watercolur cobalt blue handles differently to cobalt blue hue and has more character for it. Splendid to see this thread and marvelous work. On a more positive note (depending on your point of view), I read somewhere recently that many art college professors and teachers are currently engaged in a mad scramble to relearn old techniques in anticipation of the possibility that the infamous 'post-skills' era is coming to an end. MORE ON DRAWING - A BALANCED DIET? I wasn't going to come back to the subject of drawing just yet but as life drawing has been mentioned a few times, I thought it probably a good idea to say a few more words. The old masters had plenty to say on the subject of drawing and how best to procede, to train and be trained. If I were to try to sum up their advice it would sound similar to the advice you get regarding a balanced diet: everything in moderation and not too much of one thing. Life drawing (drawing by observation) is seen as just one of the essential pillars which help shape an artists' abilities. Writers I have read are unanimous in their opinion that life drawing alone produces artists who are 'imprisoned' by their lack of ability to draw anything from either memory or the imagination (which was referred to as 'invention' in former times). They also believed that an artist who could only draw by observation would be unable to 'refine' their drawings using additional knowledge and that, as a consequence, their work would merely "hold a mirror to the ugliness of reality" (I can't remember where I read this particular quote and I'm sure I've paraphrased it anyway! ). In the world of the old masters, copying the best of ancient Greece and Rome (paintings, drawings and statues) was of equal importance to life classes but the key point they were keen to make is that the artist should gradually learn to commit such copying practice to memory. So one day, an apprentice would copy a sculpted hand and the next day that apprentice would attempt to re-create what they had copied without reference to the sculpted object (or their copy obviously). It sounds obvious but is easy to overlook the fact that what we now refer to as pagan gods - the gods of Greek and Roman mythology - were as real to the ancients as our modern god is to christians,etc. The ancient Greeks sought to represent their gods (as well as associated significant mortals) in painting and sculpture. They assumed that the proportions of these gods would be more perfect than any individual mortal (with a few exceptions) so they 'created' canons of the body according to their own ideas of perfection; usually by borrowing what they considered the most beautiful features of many individuals and combining them in one figure. Later, the Romans refined these proportions according to their own tastes and later still, the old masters drew from this wealth of information in order to shape their own figures. The whole point of the Renaissance (re-birth) was the re-birth of interest in this older religion (which had never fully disappeared in Italy). Renaissance painters and their successors were convinced that the ancient Greeks and Romans had reached a level of perfection in art that couldn't be surpassed and could rarely be equalled. 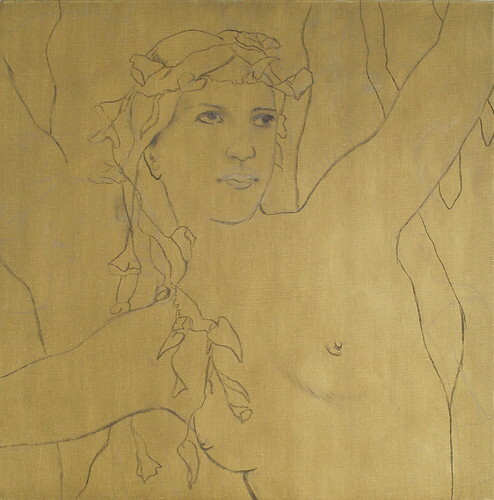 Putting all of the above together, it was common practice for artists to use life models principally to obtain a general outline drawing with the correct foreshortening, but as the drawing was refined, they drew more and more upon their own knowledge, memory and imagination to create the final figure. This was seen as important because if every artist only drew from life, then how would it be possible for them to show any individuality in their figure drawing? And how would they be able to complete a commission representing the perfect proportions of a god if they couldn't find an equally perfect life model? With all this combined knowledge, figures could be 'designed' according to the imagination and desire of the individual artist. (There were a very few 'universal' rules: "the figure must have snake-like outlines with no sudden or abrupt angles", "the figure must strive to reflect the full grace and / or dignity of the human soul", etc, etc). For a painting to be judged as 'masterful' it was thought that the four elements (observation, memory, knowledge and imagination) should be evident in the drawing in roughly equal measure. The only time that observation was permitted to dominate the other elements was if an actual likeness (a portrait) was commissioned. Whether or not you choose to follow the precise example of the old masters is a matter of personal choice but whatever you intend for your paintings, it seems to me that a balanced diet (observation, knowledge, memory, imagination) is pretty good advice! These first few posts of mine are intended as a 'quick start' guide to old fashioned painting techniques without going into excessive detail. Just to finish off this quick guide, I want to briefly describe alternative strategies and plans to the one I've already presented. A logical Alternative Plan... (recommended mainly for oil paint rather than acrylic). Stages 6. 7. and 8, as per previous plan. All it needs now is the final few stages of painting. NOTE; with reference to a previous discussion, you'll notice the optical illusion that a pale purple appears where the scumbled white overlaps the shaded areas - even though no blue has been used at all in the painting so far! This illusion can be manipulated, enhanced, exaggerated by the choice of colours that the painting is glazed with in future stages. This simplicity and effectiveness is probably the main reason that this method of painting became the most popular of all traditional methods. 1. This alternative is especially useful if a significant proportion of your painting is going to be devoted to figures - it is much easier to paint an accurate chiaroscuro then it is to place an accurate glaze within boundaries, so why not do at least one glaze first? 2. Some people find that it helps them to sort out the tonal values of their paintings (including myself) if the brilliant white of the canvas is already obscured by a neutral - ish mid tone glaze. All you have to do then is add your highlights and shades. If you work from a pure white canvas, sometimes, the tiniest section of unpainted canvas can have a disproportionate effect on your perception of the tonal values of the picture as a whole. 3. Aesthetic reasons: Even when you cover this verdigris glaze with other colours (a blue sky or dark foreground, etc, etc) it usually has a beneficial influence on the unity of a painting if a little of the ground is visible in all parts of the painting. Glaze the canvas with 'Bistre' or even just English red. Research by the National Gallery in London has revealed many painters beginning with a Red base layer. I would suggest that it was done for similar reasons to the above. As I've already mentioned, the MIXED method of painting (as described by the Slade professor of Art at Oxford University in 1910, C.J. Holmes) is basically the transparent FLEMISH method but with the addition of opaque stages, particularly in the highlights (the scumbles / velaturas and solid painting). Flemish masters generally used VERDIGRIS to complete their Chiaroscuro underpaintings. This is NOT TO BE CONFUSED with the tube colour 'verdigris', the verdigris they were using was a mix of YELLOW OCHRE AND BLACK. This mixed verdigris is a very flexible colour in that it can vary from near black to near yellow with every possible shade in between. Obviously, the tone of your mixture (dark or light) will have a profound impact on the look of your finished painting. Generally, the whole painting would be rendered in monochrome and in great detail using this verdigris before colours were added in glazes (leaving the highlights in the pure white of the background). Skin tones, would rely on the application of very thin glazes in yellows and pale reds which were modified into pinks and creams by the reflection of light from the brilliant white ground of the painting. With time painters found it either easier and / or more effective to render the lights with solid or veiled colours near the final stages of a painting and so the Mixed Method developed. I suddenly became painfully aware how didactic my posts sounded - didn't mean to be, just can't help myself - so I've changed the title and modified my language here and there. My next post is taking longer to put together than I anticipated, so I've split it into two parts. I really just wanted to show you some examples of what can be achieved with the techniques I've described so far in the hands of a few 19th century experts. I thought I would post a few photo's and explain how it was done - that sort of thing - accompanied by a 'background information' section on the 19th century painters world. So part one is the background, then in part two, I can concentrate on practical examples and explanations. Open any texbook on 19th century artistic movements and (ignoring the impressionists for the moment) you'll read 'neo-classicists, romantics, realists' etc. Personally I find these unsatisfactory as they are tags which seem designed to accommodate the observer rather than promoting an understanding of the drawing and painting tradition in which the painter worked. For example; if a painter painted scenes of people in toga's - they're a neo-classicist. If they painted a pretty woman in a voluminous, silky dress, seated in a railway carraige or staring across a wide open landscape toward the mountains - they're a romantic, etc. etc. They are distinctions which tell you nothing about the nuts and bolts of how the painter was able to put the painting together! 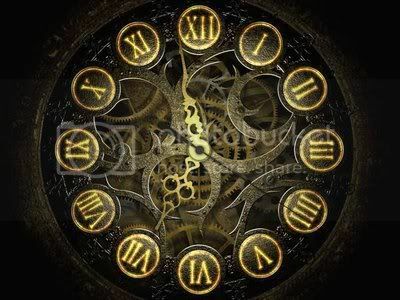 In this respect, there were only two broad movements: classicists and realists. Observation = copying from life (i.e. life drawing or portraits). Memory = having committed to memory, the things learned from copying old and ancient masters. Knowledge = influence of knowledge of anatomy and canons of the body. Imagination = usually involved 'tweaking' the above elements to make something distinctly your own. In the first practical demonstration (post: PART ONE), you could see how dependent the painting was on not only the outline of the drawing but also the light and shade elements of the drawing. Put these two together and you have a painter who works in the 'classicist' tradition. Generally, they strive to give each of the four elements of drawing equal weighting and their drawing influences absolutely dictate the final form of their paintings (in my demonstration, I put rather more weight on the 'imagination' element but the drawing does pay lipservice to the other three). Realism, as a movement, had nothing to do with the level of photo realism in their paintings. Indeed, many painters working in the classical tradition could produce a much higher degree of photo-realism. It means simply that they painted real people doing real things - peasants in Breton fields (where the movement started), fishermen hauling in nets and bringing home the catch in Breton villages, as opposed to idealised people placed in historical, spiritual or allegorical settings. It was more than the subject matter that was real; they strived to give more weighting to observing reality in their drawings - the outlines, light and shade, etc, - as opposed to observing the 'ideals'. So, for example, if a person had a nose that was too short to comply with the ancient canons* - they painted that person with a short nose! They didn't - as was generally the practice in the classicist tradition - sneakily 'lengthen' the nose in their drawing to make the subject more 'attractive'. Audiences and critics weren't used to seeing such 'naked' reality and dubbed them the ugly movement, when they first showed their paintings at the Paris salons. So you can see from the above descriptions of the classical and realist drawing and painting traditions, that painters from either tradition could have painted subjects in any of the usual genres; artists working in the classicist tradition could paint romantic or realist subject matter and equally, there was nothing to stop a painter who placed more emphasis on the 'real' from applying that to classical subject matter. In the real world, we all accept the old maxim 'beauty is in the eye of the beholder'. What one person may regard as exquisite beauty is plain ugly to the next but what we're talking about here is an idealized, canonized, formalized, academic beauty. Beauty by consensus, if you like or at least by elimination! 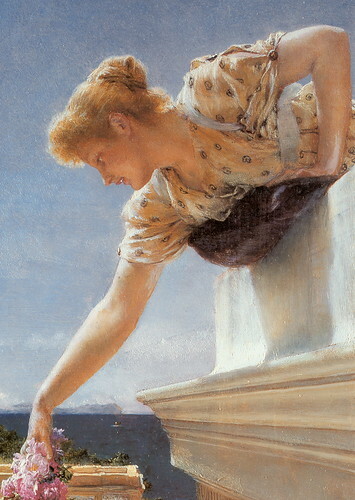 It wasn't only the artists that were busy refining their trade; over the centuries the 'teachers' played their part too and by the 19th century what was deemed 'suitable teaching material' had been narrowed to a few of the most perfect examples of the old and ancient masters work (paintings and sculpture). It was by these specimens that art students in the academies and schools learnt to draw and thereby dictate the form of their paintings. On the plus side, paintings were arguably technically better than they'd ever been. On the minus, they were criticised for lacking what could be described as that 'hand made' quality of their predecessors, which only the odd imperfection here and there seems to provide. A side effect of such perfection, seems also to have been that they were openly criticised as lacking the 'verve' and energy of earlier masters, though I'm personally not convinced that this was down to the style so much as not having quite the same missionary fervour as the old and ancient masters (but that's another story!). The other main problem was that the teaching method was just too successful! Too many students were able to attain standards once achievable only by the few who had been lucky enough to find excellent masters. So they were quickly lumped together as the 'academics'; a term which in time, was to become a derogatory one. The first 'salon des refusees' took place in the 1860's but it took a long time for the impressionists to gain any kind of mass, popular support (which was far more important then than it seems to be now), which is why they are more usually associated with the beginning of the 20th century than the 19th century or the Victorian period in general. 2. An 'Ebauche' or 'Oil sketch' - a very rapidly executed 'impression' of the subject in oil paint, capturing the major colours, lights / shades and general compositional elements*. The artist would then take the sketch and the ebauche back to the studio, work on the detailed drawing and paint it. 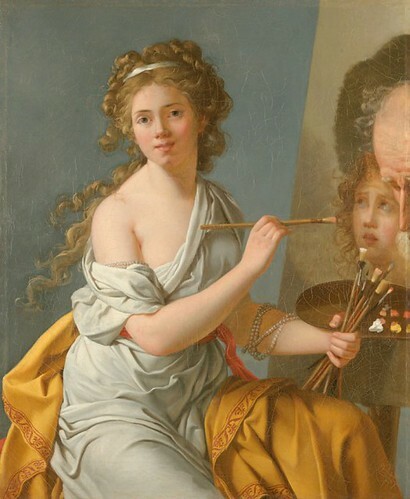 *An ebauche had other uses - the artist might do one in the studio too, just to sort out a colour scheme before paint was committed to the canvas intended for the finished picture or to give a prospective client an impression of the finished painting, when shown alongside their detailed drawing. A rapidly executed impression of the subject, lacking detail but capturing the major colours and general layout + done in one sitting (Alla Prima) = IMPRESSIONISM. I doubt I could say any more on the subject of the impressionists that you don't know already, so I'll end there. I'd never taken an Art History course, so a lot of this stuff is news to me and very interesting, might I add. Go on with your well written posts! It bothered me too that I couldn't remember what that section of the Tyl Ulenspiegel story was about and thanks to you I've now found - audiobooksforfree.com - and downloaded it! So thanks again, I love listening to audiobooks while I'm working, even if I can't actually concentrate on what they're saying! I thought it worth mentioning again that one of the reasons I'm putting these posts up is because I think the techniques are absolutely applicable (not to say appropriate and / or authentic) techniques to be used for 'steampunk' art. I've seen some great drawings on the 2nd art thread which I think could be turned into great paintings and I've seen some great digital work which I think would be killed by the use of contemporary alla prima techniques. I think Justice could only be done to them in oil (if so desired) with these old fashioned painting techniques - I'm not trying to turn you all into neo-Victorian painters. Having said that, if, after seeing how great they are, that's what you decide to strive for, I wouldn't be sorry!!! (iv) INVENTION / IMAGINATION (something added which is uniquely your own). A METHOD consists of a painting PLAN, comprised of several STAGES, each one executed using various TECHNIQUES. 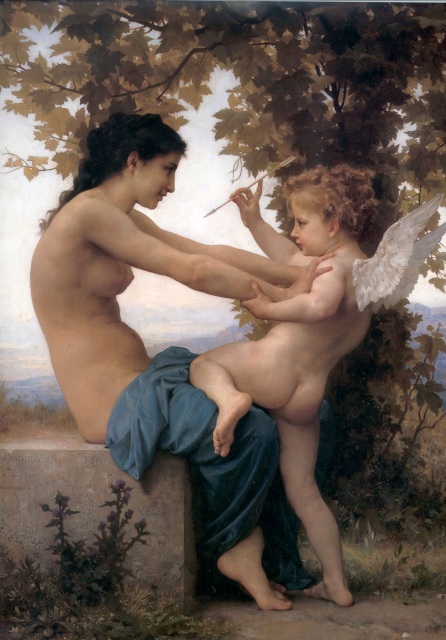 eg: Bouguereau s/o (Picot, David) = Bouguereau was a student of Picot, who was a student of David. whereas: Bloggs s/o (Smith + Weston) = Bloggs was a student of Smith and of Weston. inf = influenced by (if not directly taught by. 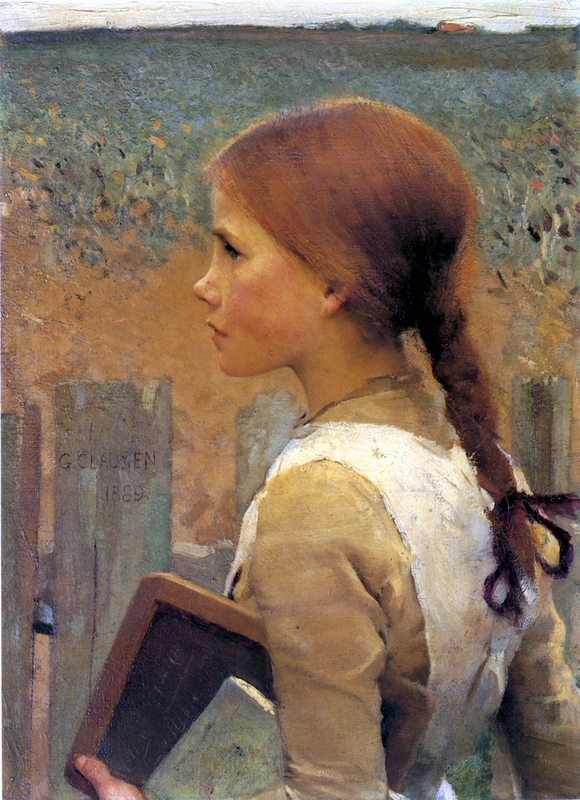 For example, Alexander Stanhope Forbes was taught by Leon Bonnat but more obviously influenced by Jules Bastien-Lepage). (NL) = Netherlands, etc, etc. 1. Jacques Louis DAVID (1748-1825) (F) s/o(Francois BOUCHER). If all roads lead to Rome, then virtually all 19th century painting leads back to this man. Even if some of his students, or the students of those students started new movements, ultimately, it was the enormous influence of David which shaped 19th century painting. Good example of the earliest stages in the techniques so far described. The drawing has been transferred and fixed, the chiaroscuro done with verdigris leaning toward the black, then the lightest of yellow ochre glazes plus a few light scumbles and a dab of detail to the eyes - that'll be £100,000 please, thank you very much! This one is a bit more advanced but still shows how David was a master at doing as little as was necessary - to prove you are a master! The shadow side of the face is pretty much the original verdigris glaze with which the canvas was pre-toned. 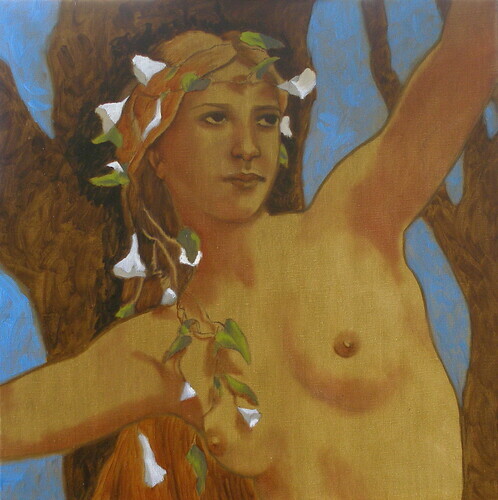 The background would have been glazed darker again at a later stage. You can clearly see where the scumble ends and the shadows begin. He's used plenty of vermillion in his final stages, so that he can do the highest highlights in Naples yellow (with white) - more common on a mans skin than finishing the highlights in pink. Whichever way you do it - pink highlights on yellow or yellow highlights on pink - it is the contrast between the two that makes it look like skin. The ear is made to look more pink than the rest of the face with vermillion too. Only the darkest shadows of the jacket were done at the chiaroscuro stage. The rest is just glazing - I doubt there's any solid paint on the jacket but there is on the collar and the waistcoat (in the highlights). 2. Baron Jean Antoine GROS (1771-1835) (F) s/o (DAVID). Great painting isn't it? It is a perfect example of what I said in one of my very first posts; the techniques themselves aren't that difficult to demonstrate but to bring them to this level of accomplishment ..... well that's a different thing entirely! Sadly, Gros ended his life by throwing himself in the Seine. Why? 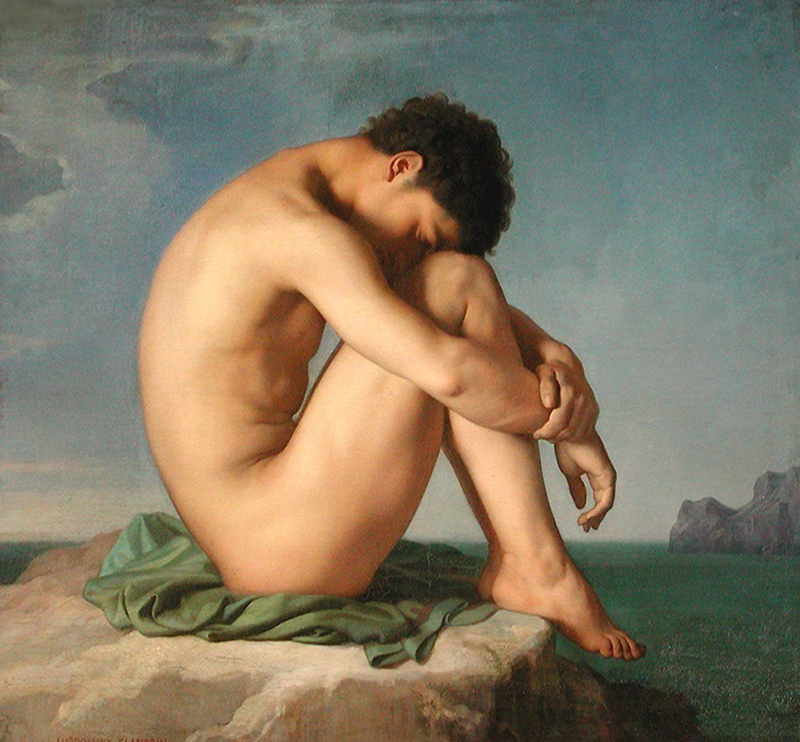 By all accounts because he was depressed about Romanticism taking over from Neo-Classicism. And this, despite the fact that the romantics were still using the same techniques - as had the majority of painters in all genres for the previous 400 years! Virtually all of Baccus's arm, the back of his neck and a lot of his torso is absolutely transparent and probably the colour of the pre-toned canvas (with a verdigris glaze). 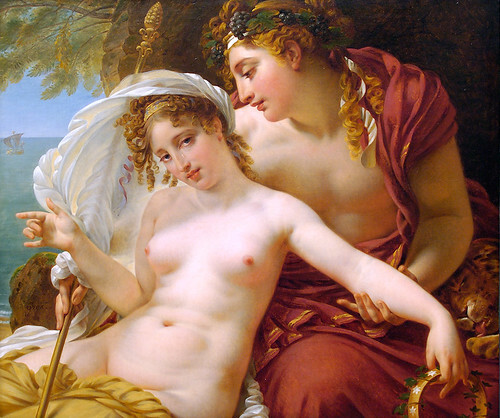 You can see echo's of this transparency in the shadows around the eyes and on Ariadne's hand pointing out to sea. The pink reflections on the underside of the breasts and arms obviously needed white with the vermillion (white usually kills transparency) but Gros has tried to keep this mixture very thin - almost the level of a glaze - so that it doesn't totally obscure and ruin the transparency of the shadows. The drawing is so absolutely classical and Gros's knowledge and skill level so high that I doubt he needed any live models at all for this picture - maybe a hand model for Baccus's hand which is suppording the Ariadne's arm ..... naaa, I doubt even that! This self-portrait is another one I've chosen because it's easy to see the techniques I've described in action. The shadow side of the face is clearly transparent (with the exception of the little bit of scumbling + vermillion on the cheek). The interesting thing about this 'self-portrait' is the lack of trueness to reality. 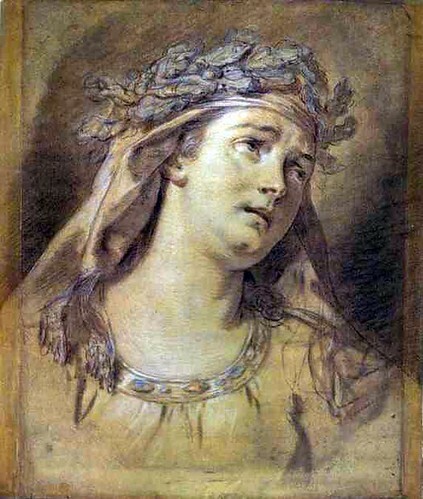 The drawing and painting of her body is clearly a result of her classical training - almost as if she has placed her own head on the shoulders of a body drawn from an antique statue - making this painting a clever example of a portrait which has been enhanced by additional knowledge. As a result, she's produced a beautiful and elegant painting, rather than a dry, family snapshot. THE FABRICS - were done in exactly the same way as I've described for skin - chiaroscuro (only in the darkest shadows for such light material), glazes (for the main body of the colour i.e. the local colour) and scumbles of more solid paint in the highlights. Another painting where it's easy to see where the scumble ends but on this one, you can also see clearly where the scumble overlaps the chiaroscuro under-painting (the grey-green bits on the shadow side of the face). 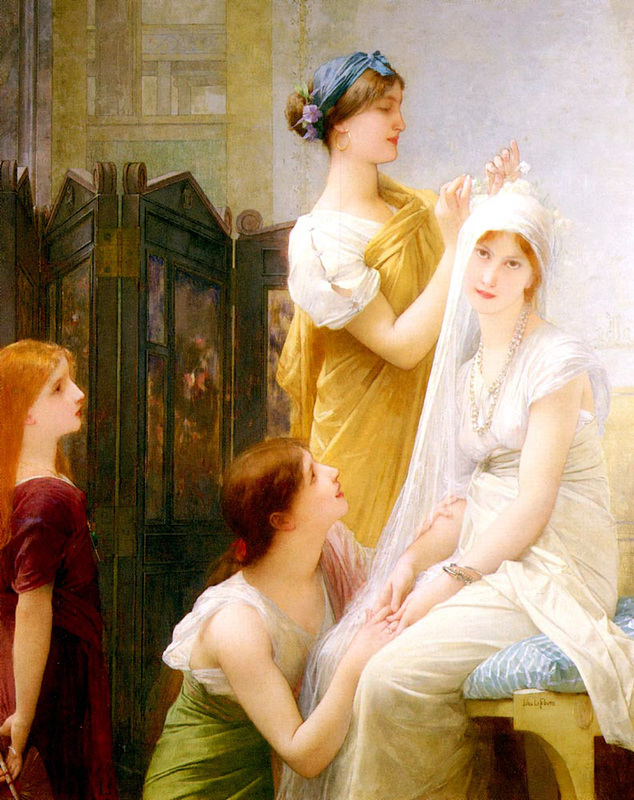 The clear, rich red area around the ear, in the corner of the eye and under the nose, I would suggest is the initial glaze which couture also uses to form most of the highlights in the hair. Because the white scumble would have 'moderated' the red under-painting into pink in the light areas, Couture has used a pale yellow (either yellow ochre and white or naples yellow) for the highest highlights to provide his skin contrasts. To keep the brightness of the purple flowers in her hair, I would say that Couture first fixed the drawing, THEN glazed most areas in the red (or bistre leaning toward the red end of the scale) leaving the flowers free of this glaze. You just can't re-create this level of brightness and purity of colour by mixing up a light purple in solid paint and painting over the red afterwards. Another prolific painter whose work is well worth looking up. 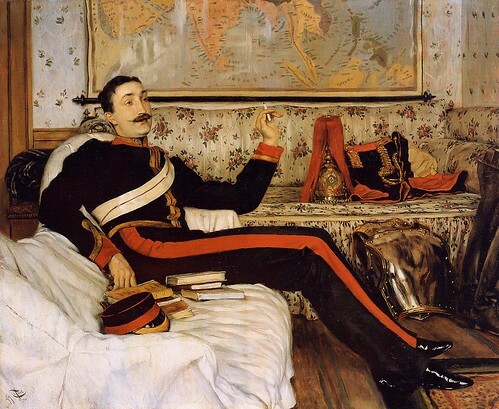 As this is essentially a portrait, you can see how much weight Tissot gives to 'observation' in both the drawing and the execution of the painting (look at that breastplate on the floor - pure observation!). It's more difficult to see the chiaroscuro in the face and hands in this picture, but it's still there (under the chin, the jaw line running from his ear to his collar, the far side of his nose, the back of his hand holding the cigarette). Sometimes, painters only render the deepest shadows in the chiaroscuro - particularly when they're confident enough to know that the glazes and scumbles will take care of the rest. Look at the fabrics and try to work out which bits were glazes and which bits solid painting - Tissot's slightly more 'impressionistic' rendering of these items makes it a bit easier to tell the difference. 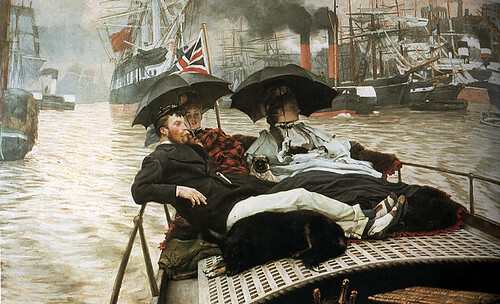 Just thought some of the fans of steam might like this one - also by Tissot. This picture isn't typical of Lefebvre's usually more natural skin tones but I thought I'd include it because Lefebvre hasn't advanced the skin areas in this painting much beyond that of my earlier simple demonstration in acrylic (he was just a better artist than me!). You can still clearly see the outlines of the figures where the drawing has been fixed (verdigris fix by the look of it) and there isn't much by the way of chiaroscuro to speak of either, which makes me think that it was possibly an experiment or a search for a new direction. It's still a great painting and just goes to show that it doesn't always have to be hard work. The drawing is classical, based on the 'narrowed down to perfection' principles of the academic system I mentioned in the 'part one' half of this post. As the 19th century progressed, many painters started extending the scumbles on skin tones further and further into the shadow areas; Cabanel was one of the earlier experimenters with these effects. 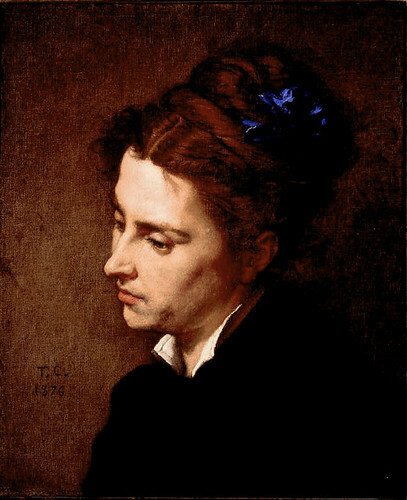 On this painting, the limited area of chiaroscuro is obvious and the only significant area of shadow left transparent is the area directly under the chin. FABRICS - look at the area of silk in the foreground. How it's done: Chiaroscuro in verdigris in the shadow areas (deepest shadows strengthened), then a glaze or two in pale purple (looks like carmine or laque garance with ultramarine to me; it's made pale by applying the paint THINLY not by mixing with white! ), then the highlights painted fairly solidly in white. A masterly example of all the elements of drawing held in perfect balance (only tiny, weeny criticism is possibly that he's neglected the 'invention' element of the figure drawing). The painting shows an excellent chiaroscuro balanced with perfect glazes and scumbles - a real demonstration piece. Well, what to say about this man? 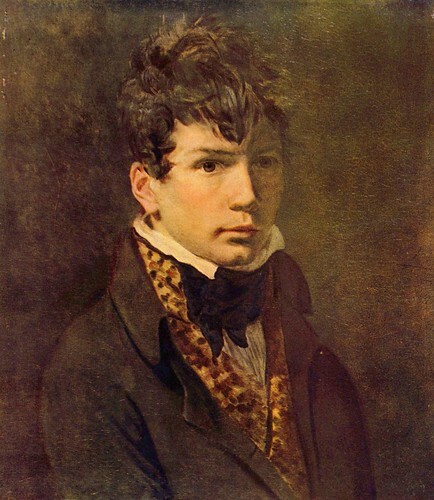 From humble beginnings he worked his way up to become one of the most wealthy and famous artists of the 19th century. He worked prolifically for more than 50 years, producing more than 800 figure paintings (usually life sized figures) of astonishing beauty and sophistication. Everything I've read about him suggests he was usually a very humble man but along with Cabanel, he's chiefly remembered for refusing entry of the impressionists work into the 1864 Autumn 'salon' thereby triggering the now famous 'salon des refusees'. By the time he died, his style of painting was well and truly out of fashion and, despite his achievements, he was almost entirely written out of art history for the following half a century. 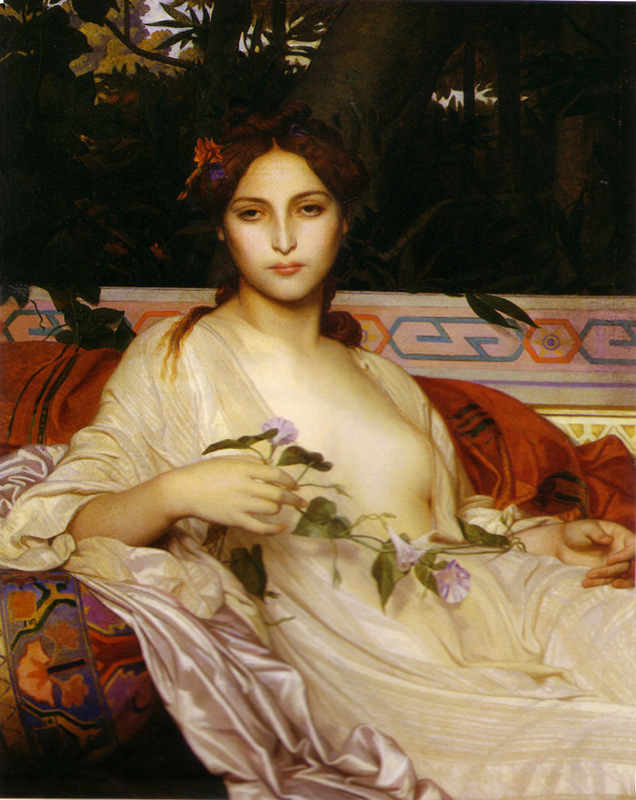 Read any Victorian novel though and the sentence "she stood by the marble fireplace next to the Bouguereau" was shorthand for saying "she was rich and cultured" - and you'd still have to pay a couple of million dollars if you wanted to put one of his pictures above your mantle-piece today! 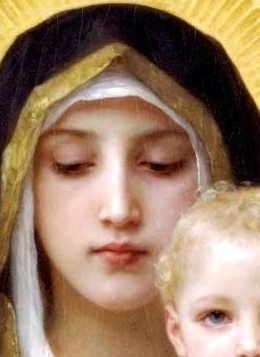 Bouguereau was another painter who pioneered extending the scumbles well into the shadow areas. This has to be done with a delicate hand (very light 'veils' almost transparent) if the three-dimensional illusion of contrasting solid and transparent isn't to be destroyed - no problem for Mr. B. (or Mr. X, as Couture called him in his thinly veiled, savage attack in the last part of his treatise on painting). The drawing is classical in the academic manner, his subjects mainly limited to mythology and what were called 'genre' paintings. I find there's a 'magic' to his mythology paintings which sums up the Victorian era for me. Good example of the extended scumbles (only the deepest shadows remain completely transparent). 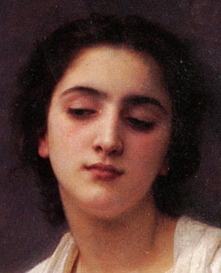 Bouguereau also used a red similar to the modern 'Permanent Red' to make his highlight pinks and often his lip colours - as opposed to the traditional Vermillion. Another academically drawn face for which I doubt if he needed a model - even though it looks like it could be a photograph! Still the classical drawing, still the chiaroscuro's and glazes but this time with slightly more 'broken' brush strokes in the solid highlights. That shadow on the wall is transparent and the light parts of the wall are solid painting / scumbles over the top of those transparent glazes. Another painter of beautiful late-Victoriana and another suicide thanks to changing tastes. This time it was the taste for Picasso that persuaded him to gas himself. 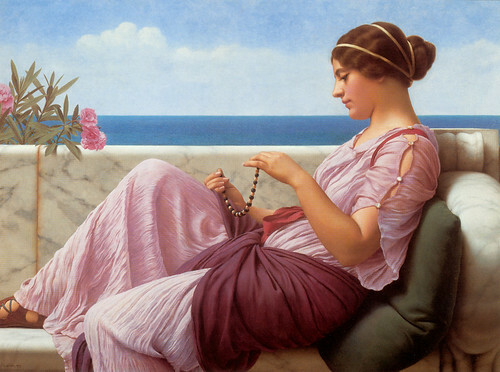 Godward - like so many painters in the preceeding centuries - was inspired by the religion, customs and daily lives of the ancient Greeks and Romans. His paintings were apparently researched to the 'nth degree to make sure that every object that appeared in them was authentic. This painting has all the key requirements of high-Victoriana; classical drawing, classical subject matter, classical painting techniques. If you look at the area around the back of her neck you can see the major area of totally transparent paint on the skin tones leading into the overlapped scumbles and continuing into the more solid highlights. I've had a go at that marble in the past too, it's much simpler than it looks. Again, a thinly applied verdigris glaze (well balanced between the black and the yellow ochre) forms the shadow areas with a smoky grey for the 'veins' applied over the top. His wrinkled fabrics are also simple, but mind-numbingly painstaking! There's only the lightest of chiaroscuro's (in the light fabrics), a series of flat glazes forming the local colour (which, in this case, looks also like the shadowed areas) and solid painting picking out the (many) highlights. Sargent was a well travelled painter and largely self-taught, though no doubt Carolus-Duran helped to guide and refine his abilities. 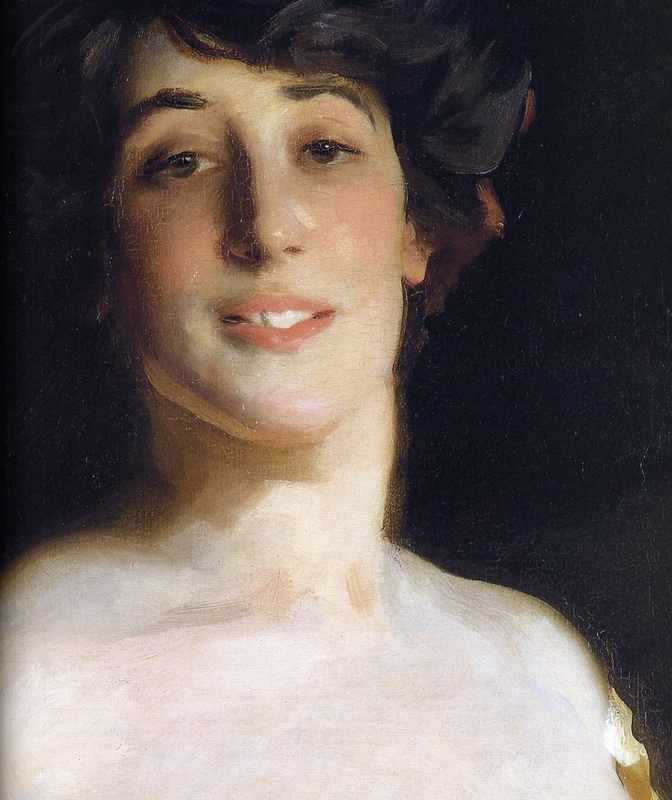 Sargent's portrait style is very recognisable and you could say 'transitional'. He prioritizes observation over other drawing elements (always a good idea if you make your living from portraits!) but there are nevertheless traces of classical influence in those portraits. His painting technique still starts out the same as previously described but using more obvious, broken brush-strokes - particularly in the scumbles and solid finishes. I've seen a few of his paintings first hand and have noticed that although his chiaroscuros' start life in a fairly formal way, he reworks them at a later stage to break them up a bit too. The overall effect, is that his work looks a bit like impressionism using the alla prima technique, but it's actually far more sophisticated than that! I pity the alla prima painters who must have tried to copy him over the years. Realism all started with this man and his summer visits to Brittany to escape the Paris heat. Straight away, you can see the contrast with the classical traditions: the shape of the boys face in the drawing (compare it with Bouguereau's rendering of the young cupid earlier) and the clear distinction between the classical style of applying paint to canvas. 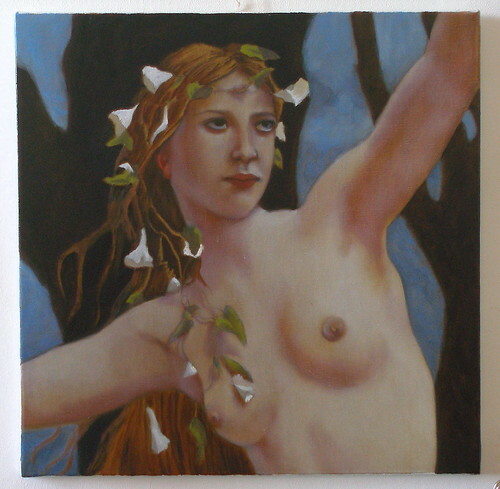 There is still a trace of a light and shade under-painting and a few glazes about the face but more of the shadowed areas in this painting are rendered using alla prima techniques (mixing the local colour directly with it's complementary to form the shadows) than the classical method of building up transparent glazes. The colours loose their brilliance but this is exactly what painters like Bastien-Lepage were trying to achieve; something less 'artificial' or decorative and therefore more true to the usual dullness of life - as befits the subject. 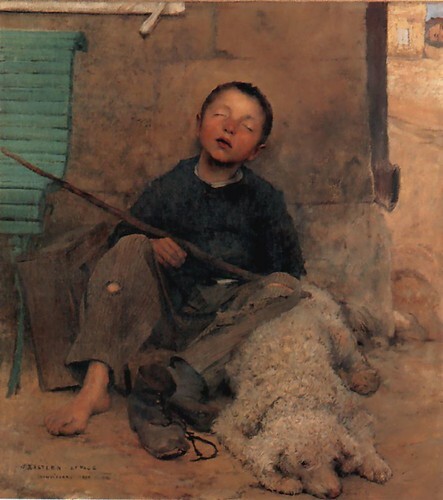 Stanhope-Forbes studied under Leon Bonnat in Paris but was more obviously influenced by Bastien-Lepage who's new realism was sweeping through the Paris art-scene. Stanhope-Forbes also went to Brittany to work but eventually found his own fishing village to study - in Newlyn, Cornwall, UK. 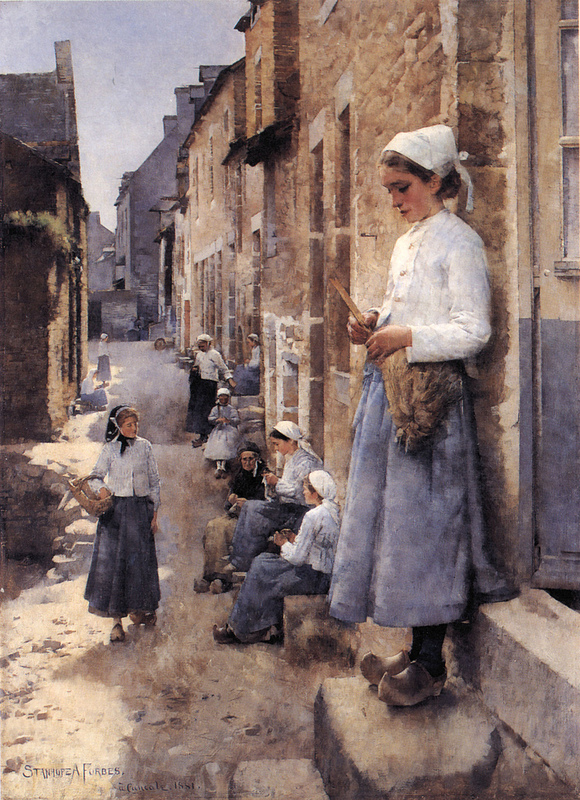 This is an earlier realist painting by Stanhope-Forbes completed when he was still working in Brittany, France. True to BASTIEN-LEPAGE's formula (and not as extreme as the impressionists) you're looking at mainly observational drawing and alla prima painting, underpinned with a broad, initial chiaroscuro which was mainly used for guidance (later to be almost obliterated with solid paint). Another one who largely rejected his principle teachers methods in favour of the 'realism' of Bastien-Lepage. Along with Stanhope-Forbes, Clausen became one of the founder members of the Newlyn school of painters - the English version of Bastien-Lepage's Breton School (or the 'black school' as it was unkindly referred to in France). OK ..... phew .... I've finally finished this post. Hope you enjoyed my selection and I hope it has helped to make old fashioned painting techniques a little less impenetrable. Some of you might think that I've concentrated too much on what was happening in France and omitted movements like the pre-raphaelites in Britain, the German nazarines, etc, etc. but please remember that this was a skim through the techniques used, not the various schools and genres and the techniques varied little. Anyway, the ideals of the pre-raphaelites were a clone of the German nazarenes (Maddox-Brown spent quite a while working in the Nazarine's studios in Rome and a short time after his return to Blighty - hey presto - the PRB is formed along the same (painting if not religious) principles). As far as technique, innovation and accomplishment was concerned, the western world did largely look toward France in the 19th century (with the exception of high and mighty Britannia, who tried her best to ignore them - I'm a Brit by birth by the way, so I can say that). I'll take a break for a while before I work on the next post. I do not have nearly the keen eye you demonstrate in your discussion of these works, but reading what you have to point out about them is certainly a huge help to me in seeing what makes them such great pieces in technique alone. When I look at art, I suppose my standards aren't too heavily based in technique, because I've just recently (through you) doubled, if not quadrupled, what I've known in terms of painting technique. I can't seem to thank you enough for what you have to offer. Thank you Naysayer, your comments have been much appreciated. I have to assume from the number of views that some people who commented at the beginning are still keeping up with the posts but a response is a very welcome thing. As regards your 'keen eye' point, I know exactly what you mean but I can assure you that by looking, by practicing and by looking again, you'll acquire that eye before you know it. This is all jolly interesting stuff, I'll appreciate these works that bit extra for knowing how they're done. GoldenHookCrafts - My etsy shop. This is a wonderfull and educational thread, I thank you! I am shaking with anticipation of the next installment! Thank you for your time, talent and expertise. These are wonderfully informative posts. Despite being a 2D art major, and having taken many many years of art history - I have only rarely come across so thorough, and accessible an explanation of technique (and well illustrated). I vote this thread be stickied.